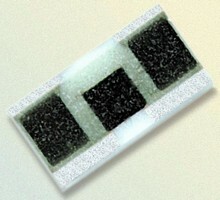 SMT Thick Film Attenuators are available from 1-70 dB. Suited for RF/microwave applications and communications-oriented circuitry, IMA2391 is operational to 15 GHz in properly matched, continuous 50 ohm system. Architecture is characterized by alumina substrate with solderable input terminals on top. Available in 1 dB increments over its entire range, with tolerance as low as Â±0.2 dB, 1206-sized product has nominal impedance of 50 ohms; 75 or 100 ohm impedances are available. Input power handling is 1 W.
Portsmouth, Rhode Island, USA - International Manufacturing Services, Inc. (IMS), a leading manufacturer of high quality thick film components to the electronics industry, announces the introduction of its new IMA2391 surface mount thick film 1206 attenuator especially suited to RF/Microwave applications and communications-oriented circuitry. The IMA2391 thick film attenuator is operational to 15GHz in a properly matched continuous 50 ohm system. It is available from 1 dB to 70 dB in 1dB increments with a tolerance as low as +/- 0.2dB. Input power handling is 1W (using proper thermal management techniques). The architecture is characterized by an alumina substrate with solderable input terminals on the top, and designed to be mounted to a single contiguous groundplane. Nominal Impedance is 50 ohms. 75 ohm or 100 ohm impedances are also available. IMS' semi-custom series of passive thick film attenuators, low pass filters, dividers and power splitters were created specifically for applications where performance is the most critical parameter. These devices employ a proprietary core design that can be quickly and inexpensively adapted to individual circuit requirements, if necessary. Since 1974, IMS has supplied the electronics manufacturing industry with highest quality thick and thin film chip resistors and chip attenuators. For more information, visit www.ims-resistors.com, or contact the company at 50 Schoolhouse Lane, Portsmouth, RI, 02871 USA, Tel. 401-683-9700. Fax 401-683-5571, e-mail: sales@ims-resistors.com. Current Loop Controller works with motorized potentiometers. Variable Resistor Module simulates PT100 and PT1000 RTDs.